“Empowered By Four Decades OF Life.” FORTYfied is created with the belief that being FORTY is a powerful feeling and a state of mind. The goal is to be a guide to those tipping towards their forties and those who still feel the vitality of being FORTY (young at heart, mind, body and spirit). The focus is on EMPOWERED thinking, improving and maintaining health for age conscience FORTY year olds and beyond. Anyway, a month before my 40th birthday, feeling that sudden wave of nostalgia, I wrote my friends thus: "It is wildly rumored and also true that I'll be 40 on March 15. Thought I'd be 'demanding' for once and ask you to send me a card, a real one with your real handwriting." I gave them my address and told them how serious I was and that I'd really love to hear from them. Soon enough, the cards arrived. I got big cards, small cards, glittery, musical cards. Got this cute drawing from a friend’s daughter. Got Pinoy cards, with Philippine art and scenes. I got those with poems and many sent photos, too. Of course, the personality always shone through. So I got those “funny” cards from naughty friends and religious messages from passionate believers. And yes, I got some of those long messages in real handwriting. Many of them were amused by the idea of a card. It’s been so long since I last bought a “real” card, wrote one friend. Many confessed to not having sent hand-written letters in years! They did one or a combination of these things: summarized my life (prepared some kind of balance sheet); predicted my future and wished me beautiful things –more joys! good health! more places to visit! fluent, eloquent French! (hay, labo yata ito) at least one bébé! ; thanked me profusely for my friendship; recalled happy and sad memories; expressed undying love for me; told me how much I’m missed; or simply celebrated the person that I am, I’ve become. I’m still celebrating this big bang of a year, consciously taking a pause every now and then to let myself be amazed by it all – where I’ve arrived at, who I’ve married, what kind of person I’ve grown into. Could this be me? Living in another country? So grown-up? Taking charge? Speaking another language? Living postcard scenes? Cooking adobo with red wine vinegar? Here I am, fortyfied. But I know I still can get that sudden stab of sadness (like I did a few days ago) and glad that I have those tangible cards and letters you sent me to help me chase un coup de blues. Show your pride in four decades of life experience with this Heavyweight Cotton T-Shirt. 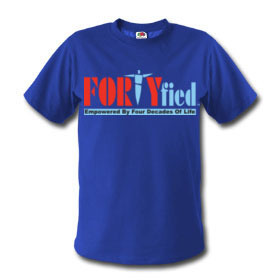 Printed “FORTYfied” graphic with tag line on front & “www.FORTYfied.com” on back. See a full selection online and display your pride in your "Life Experience"
Does Dating After Divorce Help?